"I only wanted to built a home that would give Rockford a name, "
Robert Tinker's inspiration for the Cottage came during his tour of Europe in 1862, where he fell in love with the architecture of Switzerland. In 1865, Robert began building his Swiss Cottage on the limestone bluff overlooking Kent Creek. Robert surrounded his Swiss Cottage with over 27 acres of trees, vines, winding pathways, flowerbeds, and gardens. A three-story Swiss inspired barn was added to the property which housed cows, chickens, and horses. On the side of the Cottage, Robert constructed a suspension bridge crossing the Kent Creek. This bridge linked the Cottage with his wife's, Mary Dorr Manny Tinker, limestone mansion and grounds. In 1906, the railroad bought the remainder of Mary's estate. At the end of Robert's suspension bridge, he planted elaborate gardens deemed the Railroad Gardens where passengers could stroll as they waited for the train. The Tinker family, the sole occupants of the Swiss Cottage, left their home to the Rockford Park District and their household belongings to trustees after seventy-five years of residence. Filled with original furnishings, artwork, diaries, clothing and household items, the Cottage is a rich time capsule of life during the Victorian Era. The Cottage is also one of only a handful of Swiss-style homes remaining in the United States. In 1943, Tinker Swiss Cottage opened to the public as a Museum and is supported in part, by the Rockford Park District. We have a Pre-Columbian conical mound on the museum grounds. A conical mound is around mound typically associated with Native American burials. ​Other types of Native mounds include effigy mounds (shaped to represent animals and ideological iconography) and linear mounds (typically a straight line).The mound on the museum grounds has been archaeologically dated between 1000-1300ACE. 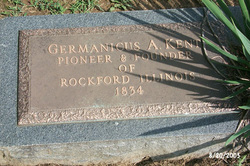 Rockford was founded in 1834, by Germanicus Kent, Thatcher Blake, and Kent's slave, Lewis Lemon. Kent built a sawmill and grinding mill that drew its energy from the water power in the creek. The sawmill attracted many others to the area for manufacturing ventures, thus developing the Rockford Water Power District. The Tinker Railroad Gardens and Prairie are now located on the original Kent property. The Railroad Garden ponds were developed as retention ponds used by Germanicus Kent for his grinding mill and are still located on the site. The population steadily grew and Rockford was incorporated as a city in 1852. Rockford's nickname at one point was the "Reaper City", thanks to the innovated creation by John H. Manny. The invention won many awards throughout the county and oversees. Due to the attention and competition, Cyrus McCormick, the other big reaper giant, sued John Manny for over $400,000 of patent infringements in 1855. Mr. Manny hired two famous attorneys to defend him in the case, Abraham Lincoln and Edwin M. Stanton. The case was won and upheld all the way to the Supreme Court. Unfortunately, the trial took so much of a toll on John Manny that he passed away from tuberculosis two weeks after the verdict. The change in Illinois law allowed his widow, Mary Dorr Manny, to control and run the Many Reaper Works, and to earn a steady paycheck beginning in 1857. Mary, the widow, was truly a woman ahead of her times, holding a position in a national company that was typically only offered to men until well into the mid 1900s. Eventually, Mary Dorr Manny married Robert H. Tinker and her legacy became part of the Tinker Cottage.